I recently fulfilled a childhood dream - I actually got to visit the Library of Congress a.k.a. the largest library in the world. It was beautiful. Unfortunately, you couldn't actually see the books - the library stacks aren't open to the public and are shelved in 3 buildings on Capitol Hill and off-site storage facilities. The Library of Congress is a research library, and the books are available for viewing by the public on the premises - you just have to get a library card from them. I wish there had been time for me to go get a library card even though I never would have had the opportunity to use it since I don't live in the area. The Thomas Jefferson Building, which is the original separate Library of Congress building, has a beautiful foyer with artwork referencing literature and the search for knowledge. 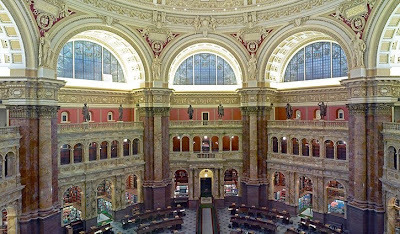 We weren't allowed to take pictures of the reading room so I've borrowed a picture from the Library of Congress's website of the Main Reading Room (see picture below). I encourage all booklovers to visit the Library of Congress if you are ever in Washington, D.C. Half of the Library's book collection is in languages other than English. Besides books and other printed materials (like telephone books, newspapers, and maps), they also have audio and video recordings, photographs, baseball cards, etc.